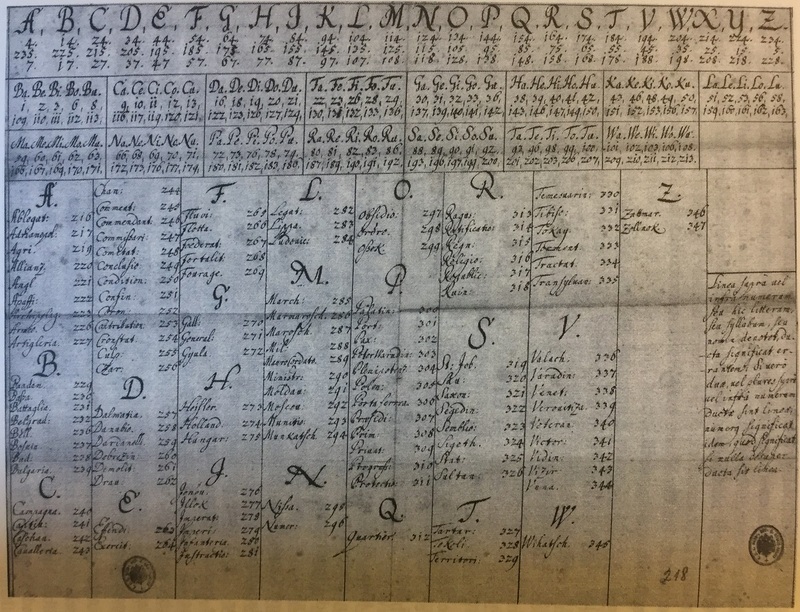 A workshop at HistoCrypt was dedicated to codes and nomenclators – for centuries the most popular kind of encryption. One of the topics discussed was a consistent terminology. Here is my suggestion. Perhaps, my readers can help to improve it. Can you decipher the following encrypted message? You probably can’t. 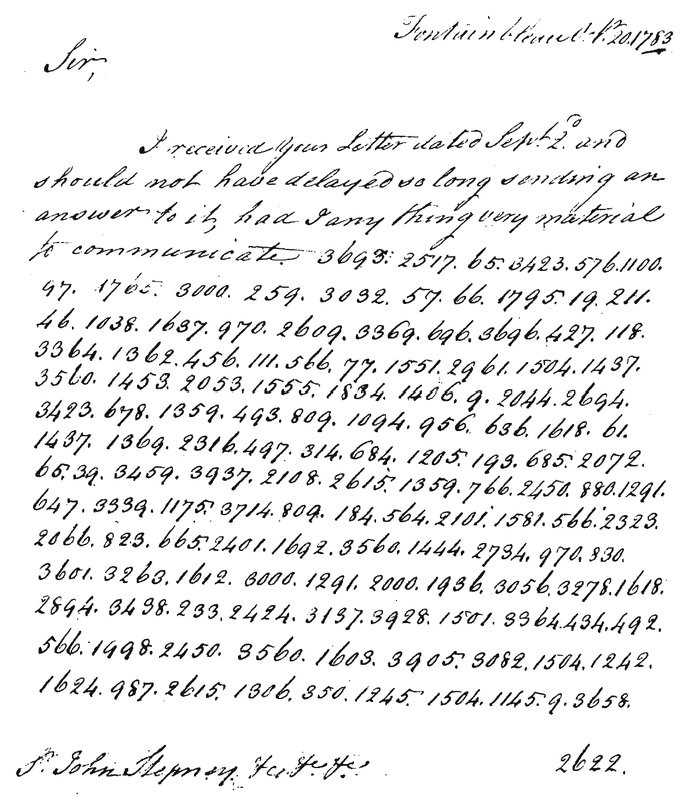 I have introduced this message (the Manchester cryptogram from 1783, check here for a transcription) several times on this blog. Many people have tried to solve it, but to no avail. 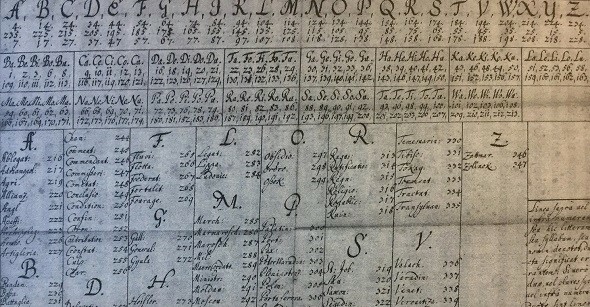 For centuries, nomenclators were by far the most popular encryption method. The following French nomenclator is from the 17th century (it is contained in the paper Briefe durch Feindesland published by Gerhard Kay Birkner in the proceedings of the conference Geheime Post). 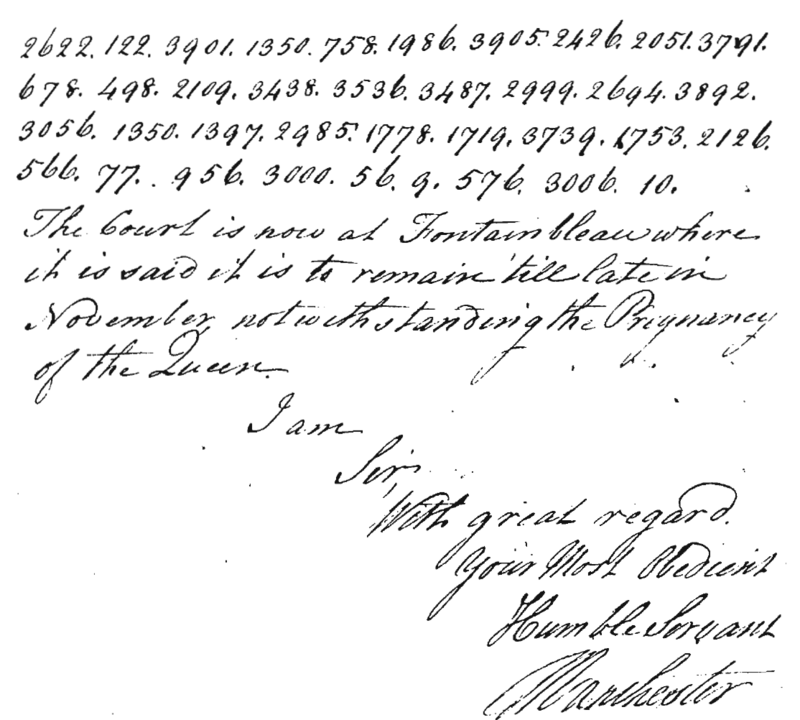 In the 18th century nomenclators developped more and more to books (referred to as “codes”) with 50,000 and more entries. When a code is used, replacing single letters doesn’t play much of a role any more, as for every common word of a language an entry can be found. Codes played a major role in cryptology until the 1930’s, when they were more and more replaced by cipher machines. 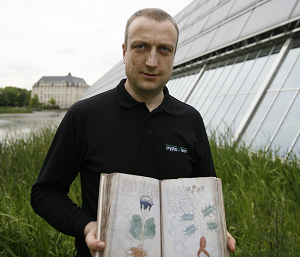 Messages encrypted with a nomenclator or code can be found in large number in archives throughout Europe and North America. There must be tens of thousands of them. Only a small fraction has been analyzed. 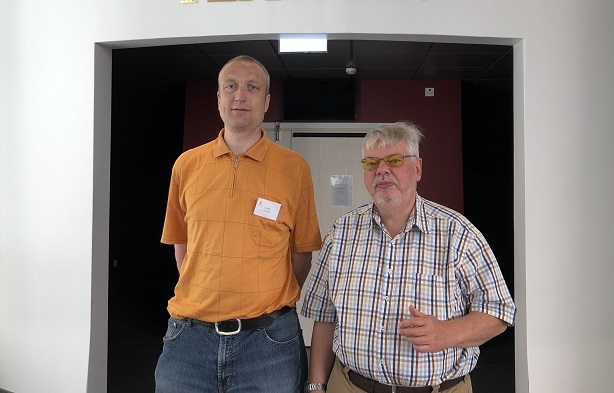 … invited experts to a workshop about breaking codes and nomenclators at the HistoCrypt in Uppsala. I was one of the speakers. In my talk I lamented the lack of consistency in the use of terminlogy. There are different, sometimes contradicting definitions of expressions like “code” and “nomenclator”, while other concepts have several names or none at all. As a result of the discussion, I created the terminilogy introduced in the following subchapter (I plan to update it, based on comments and suggestions). This version is obsolete. Please check here for a newer version. I hope that this article will help to create a consistent terminology for codes and nomenclators. If you have ideas on how to improve this first version, please let me know. Most of the nomenclators I have seen contain special code groups not only for frequent words but also for proper names of important persons and countries. “embraced nullifiers”: As far as I remember, we were talking at HistoCrypt about embracing nullifiers, not embraced ones. “ɥ ɥ delent omnia interjecta.” – ɥ ɥ delete everything in between. I applaud this initiative, the term codegroup and sorts is very good. Do you have a suggestion for a name for nomenclators that represent 2, 3 or 4 lettered parts. Now I use “codegroup” but it is not specific enough. Would “2-3-4 Lettergroup” be the best solution? ~What would you call the 4-, 5-, or 6-character blocks that often divide ciphers? ~For transmission, ciphers might have added headers or footers in another cipher or code or plaintext. I think of the composite as a “transmission” when it is sent. The word could apply to a bare cipher, as well. The letter above stems from George Montagu, 4th Duke of Manchester, who in Sept. 1783 not only wrote this letter (to King George III ? ), but also signed the Treaty of Paris for Great Britain. There is a one-part nomenclator used by his great-grandfather Charles in 1701: https://brbl-zoom.library.yale.edu/viewer/1213691. Presumably it was a similar system, but with less code groups. As to the terminology list: What do you think of an entry “one-part” and “two-part”-nomenclator?